A Leiobunum eating a cricket, photographed in North Carolina by Jeffrey Pippen. 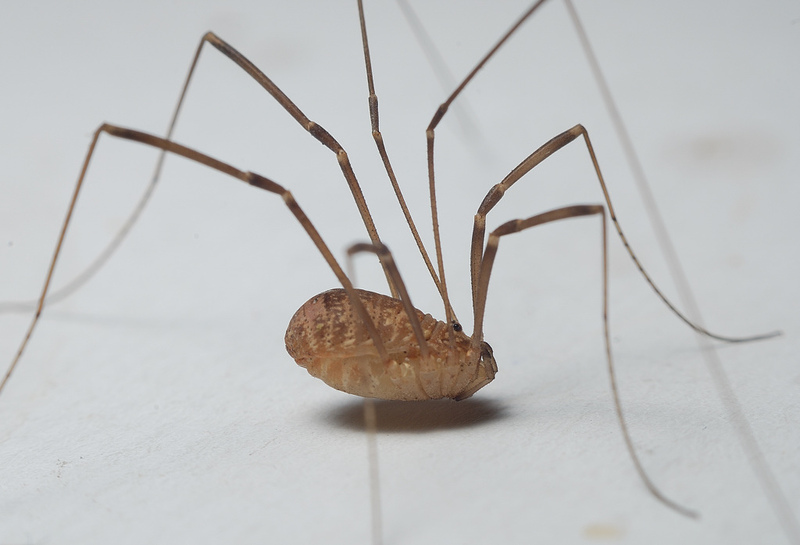 In previous posts on this site, I have referred to the problem of Gagrella: a large genus of Asian harvestmen diagnosed on the basis of characters long since recognised as unreliable that remains unrevised because no-one has yet been in a position to take on the amount of work required. Well, a paper has come out in the last few weeks that indicates that the Gagrella issue is just part of a larger problem, one of truly demonic proportions. The British Nelima gothica, photographed by Gordon. Gagrella belongs to a family of harvestmen called the Sclerosomatidae. Sclerosomatids are distinguished by having a more heavily sclerotised dorsum than most other long-legged harvestmen, and by the morphology of the male genitalia, with many (but not all) species having lateral extensions (like wings) on the shaft just behind the glans. Within the Sclerosomatidae, most authors have recognised four subfamilies: Sclerosomatinae, Gagrellinae, Leiobuninae and Gyinae. The boundaries between the subfamilies have long been realised to be a bit fuzzy, particularly between the Leiobuninae and Gagrellinae. A few molecular studies (for instance, Giribet et al. 2010) that have included more than one representative of more than one subfamily have failed to resolve them as separate. Nevertheless, the subfamilies have served as a convenient way to divide what is a quite large family of over 1200 described species, at least until a more extensive analysis can be conducted. Yikes. That is a mess. The two main genera have not only failed to resolve as monophyletic, they have completely exploded. Gyas (the type species of the Gyinae) has apparently been so terrified by this show of opilionid pyrotechnics that it has scurried off to join the Phalangiidae. The Gagrellinae have also undergone something of a breakdown, appearing in four separate places on the tree (two of those including species supposedly of a single genus). But this is not simply a matter of poor resolution: many of the incongruent clades are reasonably supported. It is also worth noting that the results are not inconsistent with those recovered by Giribet et al. 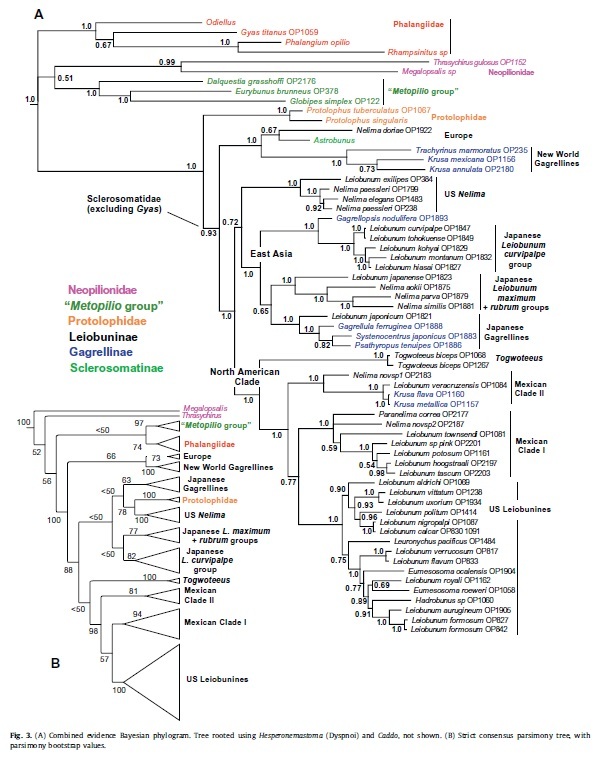 (2010) who included seven sclerosomatid species in their analysis. As noted by the authors, the distribution of taxa in the results is not entirely random. There is a certain amount of biogeographic patterning, with the European and Japanese taxa included forming distinct clades, while the New World taxa form three clades. Within the Japanese taxa (which are some of the best studied sclerosomatids), there is some correlation with species groups recognised on morphological grounds, such as monophyly of the Leiobunum curvipalpe group. This latter example is interesting, as it represents a group of species that exhibit conservative features of external morphology despite showing broad variation in genitalic characters (Tsurusaki 1985). The sclerosomatine Astrobunus laevipes, photographed by Ch. Komposch. Draining the morass of sclerosomatid taxonomy and phylogeny will doubtless be an arduous process, with all the large genera currently recognised likely to be polyphyletic. The support by Hedin et al. for previously recognised groups such as the Leiobunum curvipalpe complex suggest that morphological features will not be irrelevant in revising the family, but they will have to be analysed in their proper context. For instance, Hedin et al. suggest that the recovered polyphyly of Nelima may indicate that this genus, primarily defined by the absence of ornamentation found in other genera, may represent convergence through paedomorphosis (the acquisition of sexual maturity in a juvenile stage of development). In particular, this could explain how Giribet et al. (2009) found Nelima silvatica nested within two species of Sclerosomatinae, a primarily Mediterranean group of flattened, particularly heavily sclerotised species that might have been thought better supported than the other sclerosomatid subfamilies (unfortunately, Hedin et al. 's analysis includes only a single sclerosomatine). The view of the road ahead might be daunting, but it promises to be a memorable journey. Giribet, G., L. Vogt, A. Pérez González, P. Sharma & A. B. Kury. 2010. A multilocus approach to harvestman (Arachnida: Opiliones) phylogeny with emphasis on biogeography and the systematics of Laniatores. Cladistics 25: 1-30. Hedin, M., N. Tsurusaki, R. Macías-Ordóñez & J. W. Shultz. 2012. 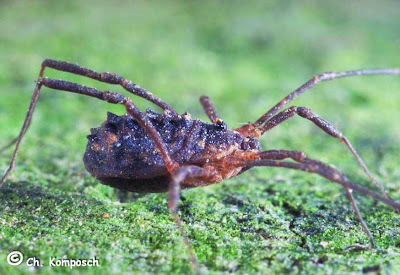 Molecular systematics of sclerosomatid harvestmen (Opiliones, Phalangioidea, Sclerosomatidae): geography is better than taxonomy in predicting phylogeny. Molecular Phylogenetics and Evolution 62: 224-236. Tsurusaki, N. 1985. 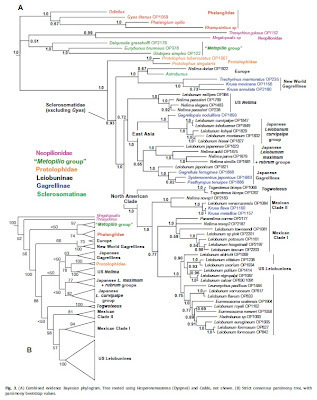 Taxonomic revision of the Leiobunum curvipalpe-group (Arachnida, Opiliones, Phalangiidae). I. hikocola-, hiasai-, kohyai-, and platypenis-subgroups. Journal of the Faculty of Science of the Hokkaido University VI, Zoology 24: 1-42. "Gyas (the type species of the Gyinae) has apparently been so terrified by this show of opilionid pyrotechnics that it has scurried off to join the Phalangiidae." That's the best line I've seen in a long time!